CDS Media Retail and trade supplier of plastic, paper and cardboard record sleeves, cd cases, cassette cases and DVD cases. Psychotron Records Site full of rare original Psych/Prog / folk vinyl for sale, also many rare 60's and 70's psychedelic posters. Round Records Round Records will help you find that missing vinyl to add to your collection. 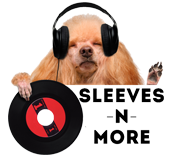 Sleeves N More SLEEVES-N-MORE exclusively supplies retailers and online shoppers with products for vinyl records. Outer and inner record sleeves. New and used vinyl.